I can not believe that I have been here for five weeks now and that it has been two weeks since my last post. I am falling more and more in love by the second. I can’t even begin to do this amazing country justice just through my poor attempt at blogging, but I will try my best. Although it is still pretty chilly here, I find something new every day that makes me forget all about the fact that I am frozen 80% of the time and reminded me of how lucky I am to be here. Just like anywhere though, some days are better than others. Living with four girls you don’t know very well can get rough, but so far we’ve all managed to talk it out, and we continue to get closer every day. And of course realizing that life back in the states is still happening without me having the chance to be a part of it puts a bit of a knot in my stomach anytime the though crosses my mind. Who is thinking of me… Who is missing me… Who wishes I were there when something happens that reminds them of me? I wonder if Grandpa is lonely, or if Grandma needs my help. If Jaxon and Ella have forgotten about me,Â if my divers needed me there for them during the biggest meets of their season, if Kelly is stealing all of my scarfs, if Andrea is sad with me for missing her birthday, or if I am letting down my KappaDelta sisters for not being there with them through Fryberger and Shamrock. But I think these are normal emotions for someone to have when they leave the life they know for the opportunity to experience something more. All I can do is remind myself that I have to live my own life and have my own experiences. But most of all remember how insanely blessed I am to have so much to miss and the opportunity to do all of the things that I want to do. 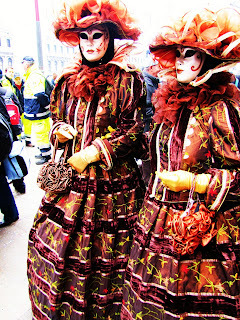 Ok, Enough about that, and more about Italy, which is, after all, the whole point in my blog! After weeks of having no idea what to do for Spring break, because everyone wanted to go to places like Amsterdam, Paris, London, and Germany which I have been lucky enough to already have visited, I have officially booked my trip! Taylor, another girl from the program was stressing too because her friend from home is coming to visit so she wont be ready to leave until Sunday while most everyone else is leaving on Thursday, and I got together and came up with what I think is going to be a pretty amazing break. We will be leaving from Pisa on Sunday, and visiting Madrid, Paris, Luxembourg, and Brussels. We booked our flights and hostels, and as far as I’m concerned, we are ready to go! Since I last posted, I have been to Verona, Milan, Siena, San Giamangio, Orvieto, and Venice, not to mention all the new things I’ve done in Florence. So needless to say I have lots to fill you in on. But first lets start in order with Friday, February 18th, which was, in my oppinion, the most beautiful day here so far. Because schooling is so different over here, me and my roommates only have class 3 days a week, so Mondays and Fridays are our days to explore Florence. So that Friday Jen, Melissa, Anna, and I decided to walk to a little pizzeria down by school and get us each a â‚¬1 pizza for lunch. Now a pizza here isn’t like it is there with 8 thick crusted greasy pieces in a box, it is a single square piece of pizza, usually with fairly thin crust. Once we got them we walked down by the river to take in the sun because it was such a beautiful day. We had no idea where we were walking, or why, but it didn’t matter. After walking for about 10 minutes we decided to get Gelato, of course. The Gelato here is phenomenal and I have a strong suspicion that it is filled with crack because it is so addicting. There are so many flavors to choose from that you are forced to get at least 2 different flavors, if not 3 or 4, at a time. So far my favorite combinations are Hazelnut and chocolate-chip, Caramel with Hazelnut and Coffee, or Strawberry with Lemon. But of course I could never choose just one. Once we had finished out Gelato, we thought it might be fun to walk toe 450+ stairs to the top of the Duomo. After Pizza and Gelato you can imagine that anything that could be considered exercise might be a little rough, but the narrow and steep stairs leading to the top were just short of torturous. Despite the side cramps and the lack of ability to catch my breath, every step was worth it when I saw the view. There were a ton of people at the top but for the most part it was silent. It felt almost rude or disrespectful to say anything and take away from the beautiful surroundings. The entire city is visible from up there and I wanted to sit there forever. The day before Valentines Day, what better place to go than Verona. The city of love and the home of Romeo and Juliet. To be honest I have never been a fan of Valentines day but this year I was determined to be positive. There was a love fest in the city in honor of the holiday, and as busy and rainy as it was, the whole place was filled with love. A plate on the well reads: Getta nel pozzo un solo soldino pensa un momento al tuo destino non ti distrarre non far rumore eccoloâ€¦ eccoloâ€¦ arriva lâ€™ amore…(Toss a single coin into the well, and as you do think only of your destiny. Do not make a sound. Do not be distracted. And alas, you will find your true love.) The story goes that there was once a young boy who was in love with a girl (go figure) and as much as he tried he was never able to convince her that his feelings were true and that she should love him in return. He finely came to his breaking point and was about to give up on his love for her. “You are as cold as the icy stream that runs through the bottom of the well!” he exclaimed. Finding humor in this she told the boy that if he would jump in the well to prove that the water was in fact icy, she would believe that his feelings were true and that she might then love him as well. Once the boy jumped into the well,there was no way of getting out. The girl felt so awful for what she had just done and had a surge of emotions that filled her with love for him. In an act of desperation she then jumped down the well to die with her love, because she couldn’t imagine living a life without him. A pretty dramatic act if you ask me, but then again that kind of passion and love that he felt for her, made him willing to sacrifice himself for her love. And as for her delayed devotion, she felt so overwhelmed by his love that she too was willing to sacrifice herself for love. Now I am not saying that death is a good way to prove your love, or even a way to at all, but that story struck me. The idea that two people in love can be so willing to do anything for the other, even something so extreme, is not something we see very often in the world today. Or as sad as it sounds, not something we see at all. Instead of worrying about everything else and letting love fit into that, is it so crazy to believe that if we are open to true love, the rest can/will just fall into place. The entry way to Juliet’s house is covered with the names of lovers who have passed through. In the picture you can only see a tiny piece of it but the entire way is covered with names on top of names on top of names. It was so insanely cute! The city itself was exactly what I had imagined Italy to be. It was the perfect little small town with small alleyways covered in vines and bright flowers on the balconies. A beautiful city of love that was so easy to fall in love with, and make me believe that maybe true love really does exist. The Duomo was an amazing Gothic inspired cathedral. Everything on it was so detailed and elaborate, but then again pretty much everything here is that way. It was somewhere I am glad I got to see, but definitely not a place I would ever feel the desire to go back to. Siena/ San Giamangio were both cute little hillside towns. And as for Orvieto, I loved it. The town was built on volcanic ash and was where the Pope resided before the Vatican and even where he would go in times of trouble in Rome after the Vatican came to be. There was only one entrance to the city at the time, and the rest was a natural fortress, which made it a safe place to be when trying to avoid enemies. Because the natural platform it was built on is remains of a volcanic eruption it used to be very hard for anything to grow in the ground there, and with there only being one entrance and exitÂ it was hard to get any type of food supply from elsewhere either. So whats the solution? How in the world do they get food? Oh ya know just what anyone else anywhere in the world would do… Dig holes in the rock that lead outside so that pigeons can come nest there and eventually become food! It makes me laugh to think of all of the things we find to be so odd and in some cases disgusting were, and still are, completely normal and accepted in other cultures all over the world. 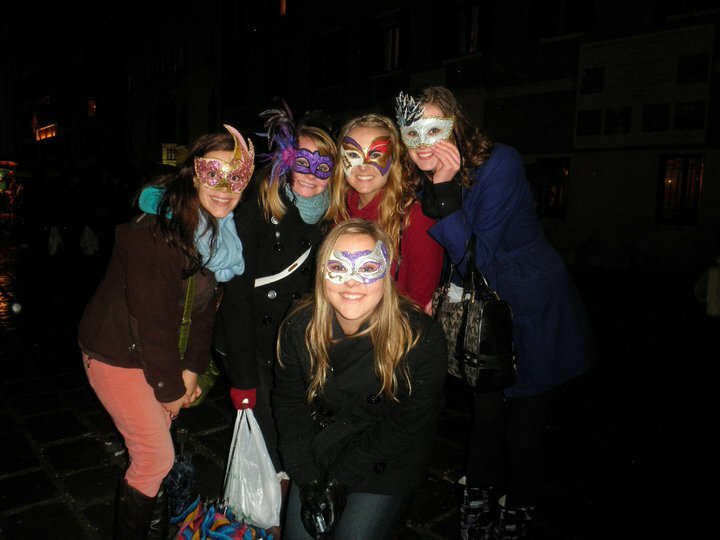 I got the chance to go to Venice for Carnival and let me just say that it was absolutely breathtaking. The crazy masks and elaborate costumes are something that could never truly be appreciated through just pictures. Which is a great thing for me considering that my camera so conveniently died during the fairy ride into the main island. I did get a few of the ride in but I will so be bumming lots more from my roommates, so I’m not to concerned. 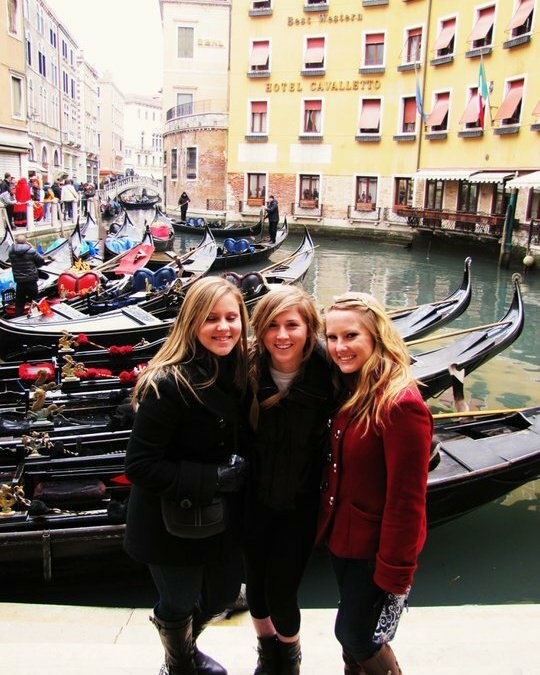 This was obviously taken in front of a Gondola canalÂ that I found to be so stinkin cute I couldn’t hardly stand it. I can only imagine what this city is like in the summer. 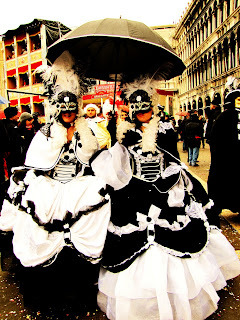 I only wish I were able to experience this city back in the day with when true Venetians roamed the streets instead of thousands and thousands of tourist in a single day. Either way it was everything that I had expected, and more. Walking down the street we almost walked straight into the water without even realizing because all of the streets end in water. Luckily there was no swimming that day, but the idea of it is definitely entertaining. 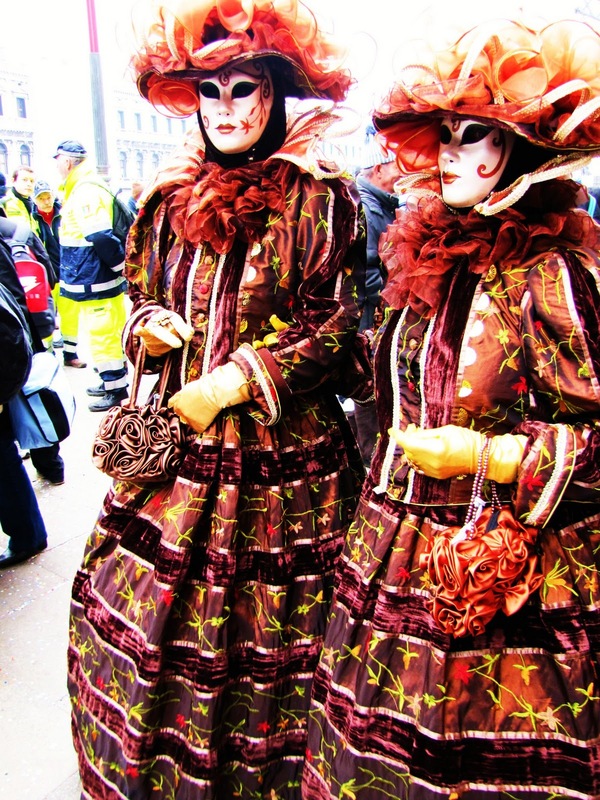 Now in case you didn’t know, Venice Carnival is known for it’s masks. The idea is with the proper costume and suitable mask, you have the chance to be something other than yourself. The half masks we are all wearing are typical of young unmarried woman. There are also full face masks appropriate for more modest women. Also the veiled masks are for men who want to maintain a secret identity. So much goes into it that you would never even think. Everything is based around history and tradition. Venice to me was a place of imagination. But of course that may have to do with the fact that I was there during Carnival, who knows. I can say it is a place I will hopefully get the chance to see again one day. Apart from traveling throughout Italy, and soon to be the rest of Europe, I still have my everyday life here in Florence. I go to class T-Th, and find new fun little things to do and see seriously every day. A few weeks ago I interviewed for an “Italian Family Club” at my university. 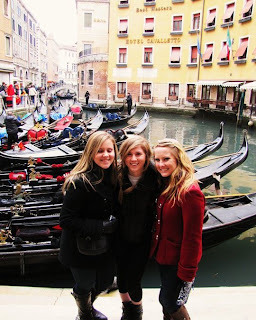 It is a program that sets students up with “host families” for the duration of their study abroad experience. Unlike most host families I will not be living with them and will just go to dinner with them and learn about their life and hopefully gain a better grasp of ItalianÂ culture. So last Tuesday I met my family and I there is so much I can learn from them. The dad is a Doctor and runs a political group here in Florence, and the Mom is some big shot over at the hospital too. They have four children, two sons that are 28 and 31, andÂ a daughter who is 15 as well as an adopted son who is 11. I have only spent a minimal amount of time with them so far but I can’t wait to learn more. There are also two more specific experiences that I want to share and will very soon but for now I have some serious readings for class to catch up on. Hope all is well and a new post is to come soon.